The biggest yet, the brightest lights and the largest crowd ever seen at an Akira fashion show last Sunday. Every year this annual event draws a bigger and bigger crowd. The 3rd annual fashion show gave proceeds to Immerman Angels charity and showed the latest fall/winter trends down a zig zag runway that took up an entire level of a car dealership. The show opened up with mens fall fashion looks. Some of the top looks were plaid on plaid. I loved the layering of collared shirts buttoned up all the way up with chunky V neck sweaters. Pants were a little shortened and even cuffed at times showing off a great ankle boot. 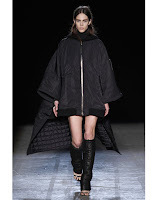 Womens fashion followed and capes stole the show, a huge trend for fall. Paired with platform shoes and some were Prada looking, laced and floral printed. I adored the lace booties that shuffled down the runway. The media pit was the largest I have seen for a show in Chicago. Every blogger and local magazine was there covering the looks that soon will hit the stores in Akira's location and Akira.com. by My Gold Mask who covered a Robyn song, men in shirtless football pads filled the runway as models rocked the next looks while weaving around the 'body guards of fashion.' I call the next looks 'the band leader of the band.' There was a definite look of rock and roll meets marching band. Red platform shoes and leather pieces. 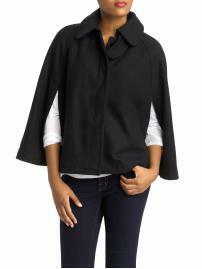 Move over Sherlock Holmes.A big fall fashion trend is the cape or poncho for fall. The picture to left is from Alexander Wang's fall/winter collection.It is an effortless but chic way to layer, and transition your summer pieces into fall. It can be easily thrown over an existing dress paired with riding boots or throw it over a Tshirt and skinny jeans and your looks is complete. Its a casual but urban look that is all the rage this season. Usually found in neutrals I love this look to transition to casual to even dressier for night with a big, chunky, bling necklace. I found some of the best picks of the season within a budget. 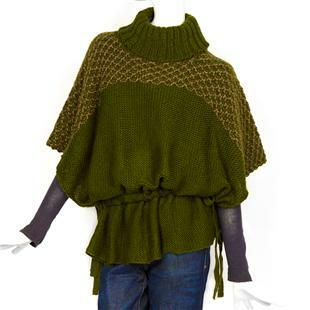 This cowl sweater poncho is a great find for $88 from Echodesign.com . Comes in a few colors and great over leggings or jeans. 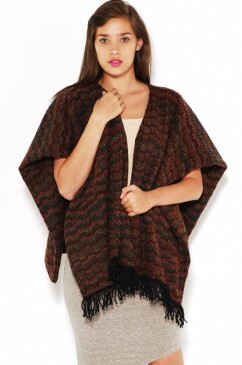 What a cozy poncho from Akira for fall. Looks like a blanket but can be belted for a polished look. For $44 this is a great find for fall!